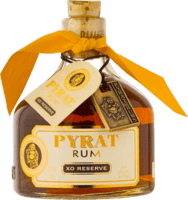 “New in the rum “world” (Nov2017) even if I have tasted a few along the years. I’ve been pretty much a Whisky explorer for the last four years and I want to diversify and discover new tastes. I’m not very good to put words on what I smell or taste so I have to experiment a lot to make decent comments ! “Pour” me ! Not a sipper At least on the rocks because a bit harsh for me. Nice product. Prefer the older ones from this Family.